Aside from the obvious, those intrepid explorers of yore discovered some of our favorite foods. With what is now known as the Columbian Exchange (named for Columbus), their culinary discoveries brought tomatoes, potatoes, corn, and peppers to Europe. But the explorers also brought their food with them as they traveled. 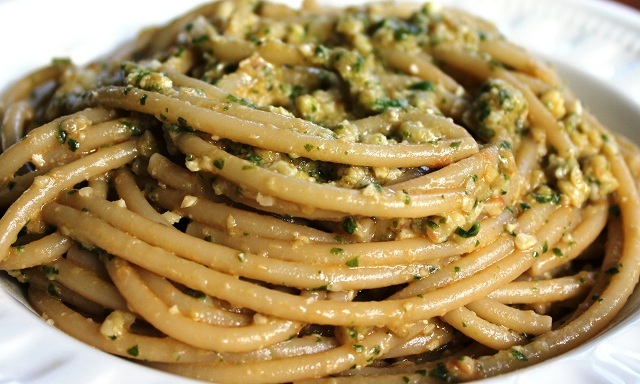 As an example, pesto alla trapanese was concocted when Genovese sailors, resting in the ports of Trapani, Sicily, used local ingredients to make their pesto sauce. Thus, local basil, garlic, tomatoes, and almonds were substituted for the ingredients of home. Explore as you may, but you probably won’t find busiati around these parts, so you can either make it yourself, or you can substitute with bucatini, linguine, or fusilli lunghi. In a large pot of boiling water, blanch the tomatoes for a minute or two, remove them to ice water, and peel and seed them. Next, blanch the almonds and peel them. If you have a mortar and pestle, pound the almonds, and then add the garlic and basil, crushing the ingredients along the walls, adding a drizzle of oil until the sauce becomes creamy. Then add the tomatoes and blend all ingredients together. (If using a food processor, grind the almonds first, then add the garlic and other ingredients.) Remove to a bowl and add the cheese. Meanwhile, bring a large pot of salted water to a boil, and add the pasta. Cook until al dente, reserving some of the cooking water. Drain the pasta and mix the pesto sauce in, stirring as it is added. Add a drop or two of the cooking water if necessary. Garnish with a basil leaf. Serve immediately. The pasta can be eaten hot or cold.